Mushrooms and toadstools are common at this time of year. They are the visible evidence of fungi; the fruiting (spore-producing) bodies of fungi growing in the soil, leaf litter, or bark of trees. Nature’s ‘recycling depot’, bacteria and fungi are essential to the decomposition of plant and animal remains. Many local natural history societies organise fungal forays at this time of year, as do a number of the National Trust properties. And then send them your findings . 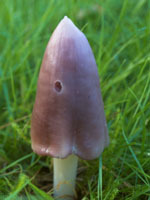 The results will be used to determine where there are large numbers of waxcaps at National Trust properties, and then these will be targeted by in depth surveys in Autumn 2008. If you’re stuck for ideas for Christmas presents, then have a look at their online shop. ¹ What is the difference between a mushroom and a toadstool? Note: there is no simple way to determine which are poisonous and which are edible; knowledge and training are required. Hi, I used to pick a lot of edible mushrooms when i lived in west sussex, (ceps, horn of plenty, chanterelles, morilles etc…) with the season fast approaching i will be looking for spots around London. Anyone one wanting to join in please get in touch. Thank you. SLBI , Norwood Road, between Tulse Hill and Herne Hill (http://www.slbi.org.uk/ ) often runs a fungal foray, but usually in early / mid October. i have a red n white toadstool mushroom on my back garden n have children do i remove it, is it poisonous? Hi, my house backs onto Hankley Common near Farnham and the woods and our garden are full of mushrooms. I’ve bought a book but am too nervous to try them. Does anyone know of any foraging events coming up in this area? Hi, I live in Bromley, Kent. Looking for woodland where I could find mushroom and enjoy walking. im very interested to know what this mushroom is called.. and is it poisonous or edible.. if there is anyone out there who could help me i would greatly appreciate their knowledge. or if anyone could point me in the right direction.. eg.. books, websites, ect.. I too am looking for a mushroom foraging course in East Sussex. I live near Lewes and am keen, but really not sure what I am looking for. Thanks Chris for the FSC link above, however all their courses are a fair distance away. Have you had a look to see what the Field Studies Council has on offer ? 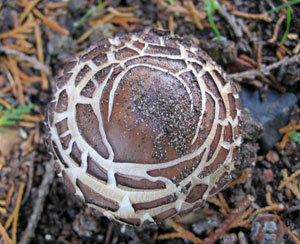 I am looking for a one day course, in woodlands, on identifying mushrooms. I live near Tunbridge Wells on the Kent/East Sussex border. Can anyone tell me of where to go please? I am doing a project for my Botany class, i want to film Toadstools/mushrooms popping up out of the ground.. the thing is i dont know how to grow my own, or how long it takes. All I know is that one day they are not here and the next they are.. If some one could help me i would really appericate it. Rook at [email protected] I need to know how to grow them, how long it takes, and how long the life span are. My friends forum, and see if you can id the mushrooms? i think tom you need to get to know them and in time you more than likely will build up a trust but be patient. First try them with a good fry up and then experiment with them in other ways and hey youll be saying what have i been doing for the last 19 years of my life ! I HAVE BEEN COLLECTING WILD WOOD MUSHROOMS FOR ABOUT 50 YEARS. I USED TO GO WITH MY POLISH PARENTS FROM A VERY YOUNG AGE. I FIND THEM VERY TASTY AND USE THEM IN NEARLY ALL MY RECIPIES. I went on a Woodland mushroom course and apparently one of the most important things, is that you must cook mushrooms, even the shop ones. We can’t digest them. The shop ones are not very good for us, but woodland ones like Oyster and Shittake are. They are high in Nova Statins (which lower cholestoral) and vitamin B12 which is otherwise only found in animals….. Many people are afraid of eating wild mushrooms – but simply by teaching yourself a couple of edible sorts that don’t resemble any dangerous ones you can eat mushrooms quite safely.